This project ended successfully on 2/7/2018 10:31! You will receive a heartfelt thank you incl. a social media shout out! You receive regular updates directly from the Fringe. It feels like you are actually there! You receive exclusive access to a "making-of" - video of "Xanthous" - a new piece written by Swedish Jazz Cellist Svante Henryson especially for Peter's show at the Fringe 2018! the very first supporters will receive the CD "Caleidocello" at this reduced price! 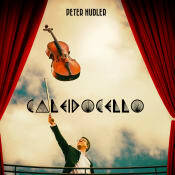 You receive a CD "Caleidocello" with Cross Over - Solo pieces performed by Peter. You receive 2 Tickets in the Front Row for one of the Shows OR a DVD with a recording of a "Cello on Fire" - Fringe 2018 Show. You receive the CD Caleidocello and the DVD with the concert from the Fringe 2018 show. CD and making of "Xanthous"
You receive a CD "Caleidocello" and the "making-of"- Video of "Xanthous". You will be at the Fringe this year? You receive 2 Tickets for "Cello on Fire" in the front row on a day of your choice and a CD "Caleidocello"! You receive a CD, a DVD or 2 Tickets (Front Row) and a really cool T-Shirt "Flaming Cello". You receive 2 CDs and 2 Tickets for a show OR the DVD. You receive 2 CDs, the DVD or 2 Tickets and the very cool "Flaming Cello" T-Shirt! You receive 5 CDs Caleidocello. Finding presents for next X-Mas just got so much easier! You play the Cello? You receive 3 Cello lessons with Peter. Either in Vienna, in Edinburgh during the Fringe or simply via Skype! You receive the astounding amount of 10 CDs. You officially finished christmas shopping first this year! Let's go for a drink. Come to a show (2 Tickets, Front Row, pick a date) and let's go for a refreshing drink afterwards at Grassmarket! You will receive an exclusive private concert at your place with the Fringe Show - Program AND MORE (2 times 40 min. with a break). In Edinburgh during the Fringe-Run. (Or anywhere else at another time PLUS travel expenses). For half the price. Peter will be your tour guide in Vienna for a whole day. He will show you around the city of music and give you a 90 min .private concert in the evening! Cellist, musician in Vienna, Austria. Cross Over/Jazz/Chamber Music. Teacher at Prayner Conservatory Vienna.